As I pointed out before, the contract said that 50% was due within 30 days of the buses being in driveable shape at the manufacturer's plant. There were the two 50% payments. That database did not reflect 30% for when the CTA inspectors say the bus is ready to leave the factory nor 15% when the bus is conditionally in service. I suppose that the latter payments will show up soon, but the payment history only reflects that first milestone. Will the press be there? And the compartment door thing sounds awesome that answered one of my questions about the new Novas about will they have a shield unlike most of the old ones but great info thanks for sharing. I hope I'll get a chance to drive them soon. If there is any precedent, it was that the unveiling of the 4000s at 103rd was after they were already sighted in revenue service on Kedzie routes. Similarly, the 5000s rail cars were unveiled at Midway station, even though we already knew they were assigned to the Pink Line. *Sort of like when the hybrid buses were used for the Olympic committee, and the one transporting the members of the media broke down. South Shops 7 appears to have confirmed 00 is here too, but I admit I hadn't thought of your point. It wouldn't make sense to assign the 7900's to Chicago, as they only have 61 Nova LFS buses, which can be easily replaced by transferring some New Flyers around. It would make sense to put the 7900's at garages heavily occupied by Nova LFS buses, which would be Forest Glen(195 Novas) 74th(106 Novas) and 77th(115 Novas). Forest Glen might be prepping for them first, as evidenced by them losing New Flyers and becoming more of a Nova garage again. I don't think the CTA wants to have one garage with the oldest roster of buses in stock only. I believe they want to spread the ages of the garage fleets a bit for reliablility. Before 2001-2002, Forest Glen had the oldest buses in the fleet, TMC's, Flxibles(5300's) and M.A.N Americanas and Flyer D901A's. Rather than replace these buses with more TMC's and Flxibles as the Novas came in, CTA opted to spread the age fleet a bit by giving them the Novas that were coming in starting in 2002, which was in the 6700-range somewhere(all LED displays, post-6708), thus retiring the Americanas and Flyer D901A's and allowing the TMC's to be transferred out and eventually the Flxibles(5300's) to be transferred out for Flxibles(6000's). This was due to preheaters in the 6000's also, and Forest Glen being a outdoor garage. 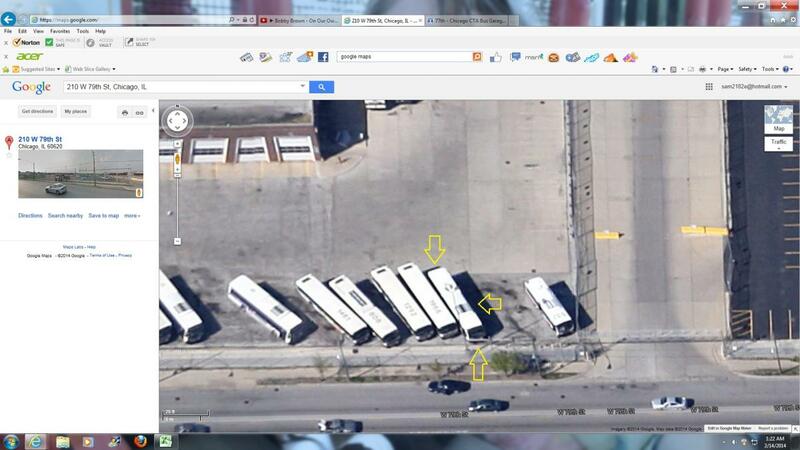 If they did debut at Chicago Garage(which I don't know because I'm sure someone out there would've gotten a picture if they ran across it, or by chance it's identified on the BusTracker as 7900 or 7901 and not a ghost bus and were able to see what route(s) it was on). It was previously discussed that employees get in trouble if they take pictures on authority property. Unless there is something like Kevin just coming across 7800 (at the beginning of the forum), you'll just have to keep scanning BusTracker, Also, it won't show up if it is being tested or a training bus, and just shows Not In Service, instead of a route and destination. The training bus idea would be an indication that you came to the wrong conclusion. I was referring to the forum members here. There's plenty on here, and I'm sure most have smartphones with good quality pixel cameras. One of them could see the bus on the tracker, head to it's location and snap a pic to upload here. But they aren't the oldest. If nothing else, all the odd even stuff in the 1000s indicates one can't predict unless one has the roster. They could go with Chicago garage first, they have the second oldest Novas and because the fleet is so small alot of those actually are in pretty good condition. We still don't know if Chicago is being eyed for a 50/50 bus model split or if Nova smart buses are even planned for 77th. If they go all NF, maybe not. I think the fact that they want to test at Chicago garage first shows an interest in putting them there. That was sort of where I was going. If the "only 65" is correct, they could get a short series there to see how they work out, sort of similar to Pace putting 6324-6376 at West, even though it didn't have any of the oldest junk. But that would be a departure from "they have to go on King Drive because the south side always has the worst buses," according to the newspapers at least for the 4400s (until the about 4700s were received), 6000s, and 64000s. I wouldn't be surprised if C gets the first Smart Buses. They could also have C receive odd-numbered buses and FG receive even-numbered buses. As for 77th, don't be surprised if they receive 1974 and 1982-2029 from C as the Smart Buses arrive; that way they can retire the oldest Novas. The fact that they placed some 4300s there as well as some 1300s out of the the D40LFs at 77th does contribute toward reducing the average age of 77th's fleet. And them doing a few tests at Chicago shows an interest. However, with only two buses here I wouldn't be too quick to postulate too far about what's going to occur with subsequent deliveries. Keep in mind that 7901 was also sighted, but nothing has been said about what's going on with that "prototype" beyond being seen down at the South Shops. For all we know, that one may be kept there to test runs on some of 77th's routes. The fact that 77th still holds the oldest Novas can't be gotten around. dann's possibility raised about 1974 and 1982-2029 does at least acknowledge that point. Well then, that makes a lot [more] sense. The training center, yes. Freedman, who cares. Right the training center has more credence on why Chicago might bump 77th in being first to receive new buses. I agree with Busjack that the seating company has little relevance here since the buses themselves are still assembled in Minnesota, meaning the seats still have to be sent out of the city to complete the finished product. The only thing done here in the city is putting in the fareboxes and the GPS hardware for BusTracker. Any photos yet. Have anyone seen them in service or just around at Chicago Garage. That sounds like a page out of the Emanuel handbook. Lol!! That is where your press conference is going to be. As far as what Dann said about NF 1974, and #1982-#2029 going to 77th that could be what happens. (But personally I feel the longitudinal 40 foot buses work better at Chicago, especially if 77th has half already) I was more less thinking Chicago could transfer some NF's to 77th and the #6500's that are there could be transferred and force #6400 retirements at 77th, because those are still in the worst shape and need to go. Sounds like Chicago may be going 50/50 after all. But don't forget the 6500s have to go as well at some point, so transferring to 77th would only be a stop gap measure. Dann's idea would at least have the merit of cutting down on too many bus shifts as delivery of new buses already causes a lot of bus shifting as is. Ok the makers of the seats in hombolt park I can understand, but what does the training center have to do with the 7900's be chosen for Chicago garage? Unless they have changed things up as far as training goes at Chicago garage from when I started a yr and a half ago I don't understand it. Training at Chicago garage was held upstairs in a class room where we just learn about the fares and things of that nature the actual learning of the buses didn't take place till after you passed the written test and went to your chosen garages. I'm basing my comments on the conditions of the two different garage fleets. If FG does still get the last 35 #6800's from 77th, then maybe they could just go with a NF transfer from Chicago, but that would mean they would still have to replace the Chicago Novas. So what does that mean? That would translate to about a 140 smart bus order for Chicago garage. Maybe the intention is to do 150, 150, 150 at Chicago,74th and FG, but that would mean Fg will have NF's still. Are there plans for a different farebox? They won't need to take chicago cards or the magstripe transit card for long (or maybe at all...). Since the cutoff date hasn't been set, it's presumed that the magstripe machines still need to be on board. That is, unless they're holding off until a date has been determined.